“I have the Power” sounds familiar? Something from your childhood memories? Well, that is not what PowerApps is but its certainly not short of magic. Think of a tool that could help you create powerful enterprise apps and workflows as easily as writing Excel formulas. Further, if you could visualize and analyze all your company data from different sources by just using a few wizards. Think no more. This is the power PowerApps platform brings to you. Recently Forrester a leading market research company named PowerApps as a leader in low code development platform. Most of the businesses today have a lot of their processes managed either manually or by using some outdated technologies like emails. PowerApps gives these organizations power to automate their processes with low code or no code at all. PowerApps further strengthens the concept of Citizen Developers and gives every individual the ability to create productive apps for their organization. So how do we create a PowerApp? If your company uses Microsoft Online services like office 365 or Dynamics365 you might probably already have PowerApps in your plan. If not just go to https://web.powerapps.com and create a trial. Using PowerApps is as easy as using PowerPoint and Excel. You have PowerPoint like screens and Excel-like formulas to build apps using your organizational data. Does PowerApps work alone or as a team? 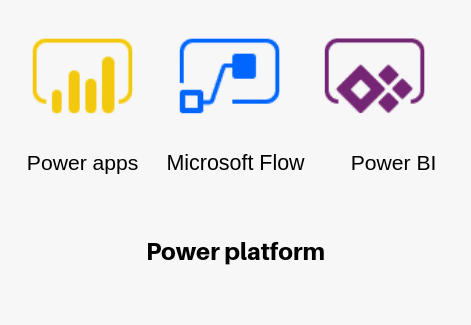 So PowerApps does not say “Avengers Assemble” it forms an invincible team called the PowerPlatform which consists of components like Microsoft Flow and PowerBI . Are there other allies of PowerApps? The real power this platform creates is by seamlessly integrating with the entire set of online services that Microsoft offers like, Office365, Dynamics Business apps, Sharepoint and Azure. Together they form a formidable team but randomly they find allies elsewhere. Microsoft Flow connects with a lot of other third-party applications to create integrations. Don’t have your application in the list? Very well you are free to create new integrations. What are the other Powers? You can create Apps that run on the web as well as on the mobile. The model-driven apps can create common views like add, update, list, and filter without writing a single line of code. Still, have a question? You are free to contact me or other experts in our team to showcase the real power of PowerApps to you. Udit possesses 18+ years of evolving experience in software project management, software development life cycle, leadership and team development across multiple technologies. Udit provides value to clients through strategic planning & analysis leading to enhanced productivity and growth in revenue & profitability.